is diving into summertime by welcoming mappers of Czech Republic, Hungary, Sweden, and Bosnia and Herzegovina to our ever-growing team of citizen cartographers in our quest to map the world. With Google Map Maker, you can contribute your local knowledge to make a more useful and comprehensive map of the changing world around us. Begin in your neighborhood and try adding the building footprints for local shops and restaurants. Then, embrace your inner traveler and enrich the maps of national parks and historic landmarks. If you’ve got the itch for adventure, try adding campgrounds, beaches or your favorite hiking trails. 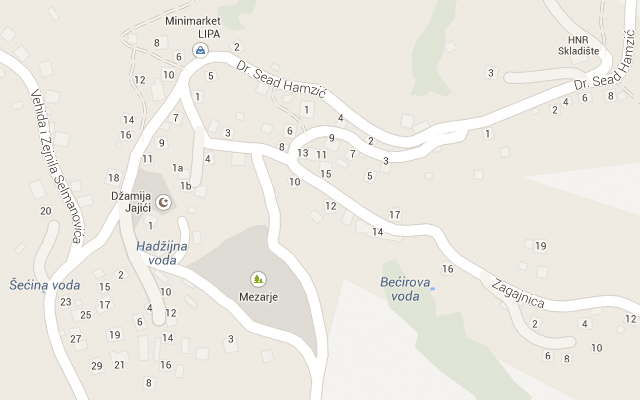 Jajići, Bosnia and Herzegovina was a blank space on the map before citizen cartographers put it on the map. Whether it’s a cycling route through Budapest or a cafe alongside Prague’s Vltava River, each improvement to the map will help locals and tourists alike as they navigate your neighborhood this summer. Once approved, your contributions will appear on Google Maps, Google Earth and Google Maps for mobile. To get started, join other mappers on the Google Map Maker community forum, explore the Help Center for tips and tricks, or watch mapping in real-time with Map Maker Pulse. Now, from the Heart Shaped Land, through Central Europe, to Swedish Lapland, you can help Google Maps to embody the rich culture and spirit unique to your homeland - starting today! Exploration is at the heart of the summer season, and what better way to take part than sharing your knowledge on the places you love on Google Maps? Today, Google Map Maker is diving into summertime by welcoming mappers of Czech Republic, Hungary, Sweden, and Bosnia and Herzegovina to our ever-growing team of citizen cartographers in our quest to map the world.